Bellies and Babies: 37 Weeks... Full Term! I am officially full term this week! 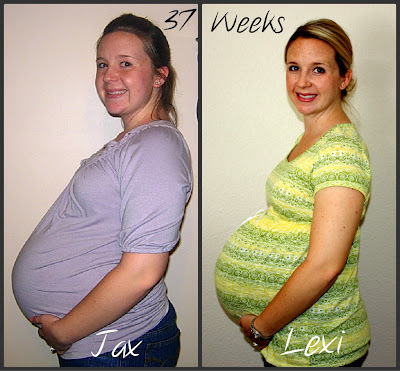 I can't believe we are down to a matter of days until Lexi arrives. I have said this before, but I am so beyond ready for her to be here. It's not even that I don't want to be pregnant anymore... although that will be nice too. It's more about just wanting to hold her in my arms instead of in my tummy. I am ready for no sleep, cold dinners, and diaper bags full of stuff wherever we go. This week has been good. 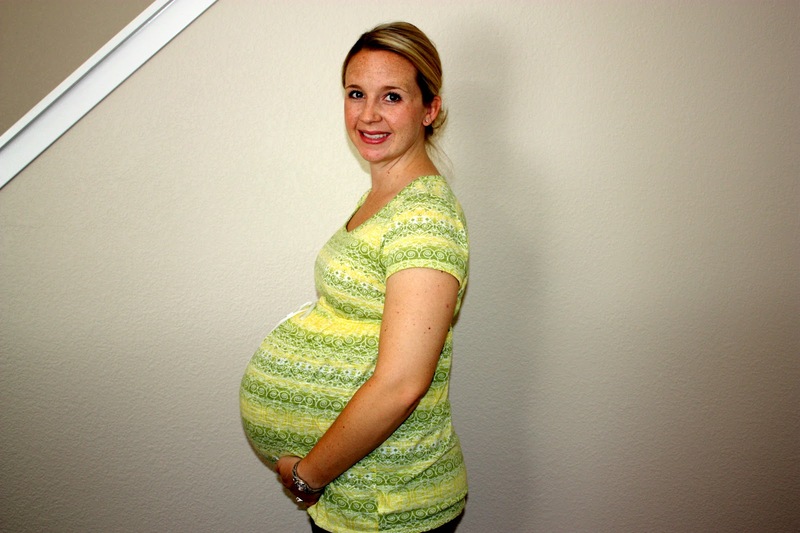 I ended up not having my 37 week appointment today, but I go back on Tuesday. I'm really hoping for some progress. Some of my Braxton-Hicks are pretty uncomfortable, so I hope that's a good sign! I've been trying to walk more, bounce on my birth ball, drink red raspberry leaf tea and have Ryan massage my ankles. I know that none of these things are guarantees to bring on labor, but I figure that they can't hurt! Here is my picture from this week. And here is the comparison with Jax. Ugh. Overall, I have plenty of energy and I feel really good. The heat is getting yucky, but it hasn't been too terrible. It's much better than when I was overdue with Jax in North Carolina and the humidity was slowly trying to kill me! I'm just praying the major heat wave stays away until after she's born. I can handle it much better if I can snuggle with my sweet girl!